Honestly,until a few days ago,I haven’t heard anything about this miraculous pooja which in literal terms is called a ‘Vratham’ which again means a very ‘special pooja’.. 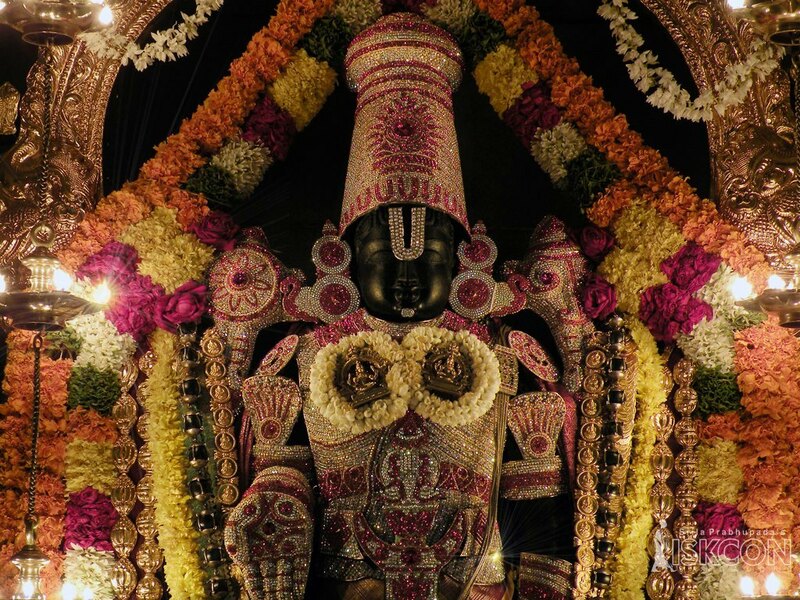 This special pooja is performed exclusively to please the holy Lord Sri Venkateswara and His divine Consorts,Sri Devi and Bhudevi while requesting them to grant us perpetual prosperity in our house and eternal peace in our lives..
Called Sri Venkateswara Vratham,this is the simplest yet the most powerful of all the Vrathams (poojas) that have so far been recommended by the great Hindu Sages and the sacred Vedic texts..Venkateswara Vratham is a very recent pooja that came into existence only in 2005..
Will you now believe me if I say that.. This noble professor had carefully noted down every word,dictated by the holy Lord Venkateswara,and later got it printed in Telugu language,in the form of a small book titled ‘Sri Venkateswara Vratha Kalpam’.. Ever since,this illustrious professor,with his own expenses,was printing ten thousand copies of this miraculous book,every six months,and was distributing it free of cost to many devotees of Lord Sri Venkateswara..
Only the holy Lord alone knows how many thousands of copies this great man,in all these years,had distributed to devotees and how many thousands of families have actually benefited from this amazing tender sized free book.. Many devotees who received this priceless book through various sources were shocked after reading the content present in it and have later have performed this all powerful Sri Venkateswara Vratham in their houses as per the instructions given in the book,. All these devotees who have performed this Vratham (Pooja) in their houses have not only seen some miraculous cures in their ailing beloved family members but have also seen many positive changes and many more unbelievable happenings in their life.. While some of the devotees got their terminally irretrievable health cases,like cancer and paralysis, cured; some had miraculous survival in near death accidents..While some devotees have recovered from huge losses in their businesses; some have recovered their lost or stolen money and jewelry.. Many renowned Peetadhipathis too are gifting this “Sri Venkateswara Vratha Kalpam” book to many of their ardent followers and devotees and are asking them to follow the instruction given in this book and perform the Vratham (pooja) accordingly.. Surprised by the amazing response,this book was receiving from many members of the European Indian community,the honorable British Library has cataloged this book in it’s London head quarters..
Now..My dear friend,I know what is going through your mind at this moment.. Relax..As you are now thinking,performing this “Sri Venkateswara Vratham” in your house is not at all an expensive affair and it also doesn’t involve any elaborate procedure that demands a lot of time from you..In fact all this Vratham (pooja) needs from you is a little time and a little more dedication..That’s all..
More importantly,this Vratham (Pooja) can be performed at any point of time convenient to you and on any given day without any harsh rules to follow..All that you need to do is to spend about thirty minutes of time,whenever it is possible to you,and buy at least two bananas or one coconut to offer to Lord Sri Venkateswara as Naivedyam..
Lord Venkateswara wanted this Vratham to be kept as simple as possible so that every devotee can perform it with utmost ease and still derive all the benefits from it..There are two simple methods for the convenience of devotee mentioned in this book..
Who this amazing professor is and why did Lord Sr Venkateswara had revealed this all powerful Sri Venkateswara Vratham to him.. The name of this professor,who is currently residing in Hyderabad,is Timmaraju Viswapathi Rama Krishna Murthy who is in short known as TVRK Murthy and more popularly as Viswapathi..He did his M.Tech in Electrical Engineering from REC (now NIT) Warangal in 1983..
During the period between 1984 and 1990 Viswapathi,as a hobby,worked in Indian Express newspaper as a cartoonist and ran the popular cartoon column under the caption ‘Sum Fun’ on the front page of the paper .. Although he worked for about four years (1984-88) in a private company he however joined Hyderabad’s most prestigious MVSR Engineering college in 1989..After working there for about ten years Viswapathi resigned from this engineering college in 1998.. In between in 1994 he started his own logo designing firm,Sri Designs and from 1998 started focusing all his energies entirely on this designing firm..It is exactly at this point of time that the divine intervention of Holy Lord Venkateswara began in the life of His great devotee..It was also at this point that things gradually started changing in Viswapathi’s life..
Viswapathi was much influenced by the Vedas and Astrolgy right from his childhood and did an in depth study on almost every aspect related to both these branches of Indian culture..Using this vast knowledge, Viswapathi started finding solutions to many human problems..
Later,combining the astrology of a person with the formulas provided in the Vedas,Viswapathi started providing solutions even to the most complicated human problems..With his unique study and also by applying the formulas stipulated in the Vedas,Viswapathi started designing the logos of many new companies..
Over a period of time,these companies have started performing extremely well and are now enjoying a solid standing in the Indian market as well as in the global market..Through these companies the word about Viswapathi’s amazing capabilities in delivering success to new companies,with his unique logo designing,had started spreading all over the place.. In fact,these companies were enjoying a big name in the world of business those days but were actually in huge losses. Saying yes,Viswapthi did a little alteration to their companies’logos,based on Vedic and astrological calculations,and had put them back on their path to huge profits.. But how far is all this stuff believable and is it really possible to alter the lives of humans and businesses of companies with Vedas and Astrology..I asked this eminent professor the same..With an unique smile only he owns the noble professor smiled and said.. Which is why on one fine morning in 1999,at about 4.30 am,His Holiness the Paramacharya of Kanchi Kamakoti Peetham,Sri Chandrasekhrendra Saraswathi appeared in Viswapathi’s dream..Placing both His sacred hands on Viswapathi’s head and blessing him,His Holiness the Paramacharya said..
As though coming events are casting their shadows,Viswapathi in 2001 wrote the first divine book of his life titled ‘Srinivasa Mahatyam’ in Telugu language..This book,that’s written about the miracles of Lord Sri Venkateswara,attained instant popularity and on one fine day,sometime during the end of 2001.an unknown reader contacted Viswapathi on his mobile ..
And this is what the unknown caller said..
“..Sir,I read your book Srinivasa Mahatyam and it really influenced me a great deal..But Sir,I have a problem which I wanted to share with you..I don’t know how and why but for some strange reasons our family is forbidden from performing Satyanarayan Vratha Katha in our houses..Many times and on many auspicious occasions we wanted to perform this pooja in our house but our elders warned us saying “we should not do this pooja in our house”.. “..He should continuously do this pooja for seven Saturdays and on the day of performing this pooja, which should only be performed during the evenings,the devotee and his spouse should not eat anything until he finishes this elaborate pooja that may take a couple of hours to complete..I can only say that it’s not a pooja everyone can do and there’s no other pooja than this that can be performed to Lord Venkateswara”..
Later,Viswapathi did his best to find out if there’s any other pooja there in the texts to please Lord Venkateswara..He didn’t find any and in course of time completely forgot that conversation and moved ahead in life..
A shocked Viswapathi woke up startled as there was also an unbearable heat generating in his body that moment..He could not believe that he had seen Lord Venkateswara talking to him in the dream..He immediately rushed into his pooja room.. 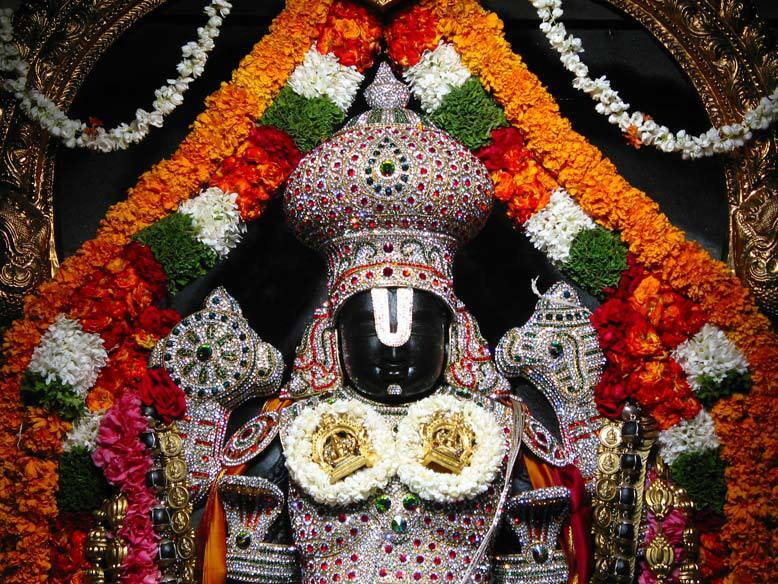 Stood in front of the portrait of Lord Venkateswara there and silently offered his prayers to Him..After about half an hour the enormous heat that was generating in Viswapathi’s body subsided..
Later he went to Tirumala to write “Sri Venkateswara Vratha Kalapam” a book that’s today changing hundreds of thousands of human lives all over the world..
And Here’s What Had Happened In Tirumala The Next Day.. 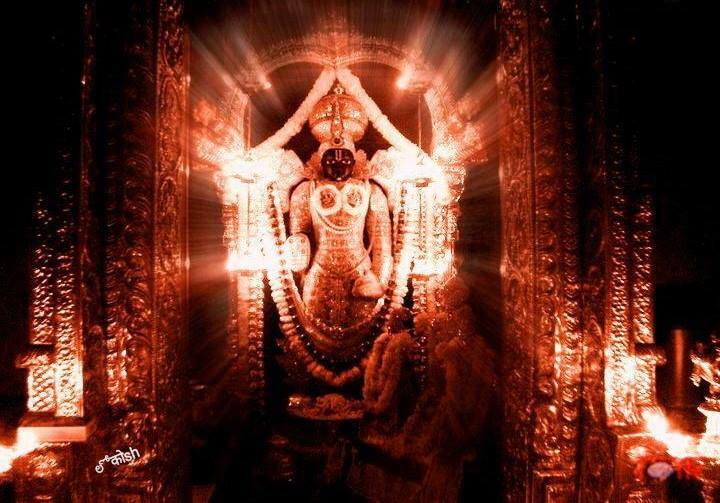 The next morning at about 5.30 am,Viswapathi reached the Maha Dwaram of the main Tirumala Temple and sat on the steps that are there in front of the temple..He then closed his eyes and silently offered his prayers to his beloved Holy Lord Venkateswara..
“The mighty Viswa Roopam of a dazzling Bhagawan Sri Venkateswara appearing before him with His ten heads and thousand hands spreading all over the blue skies that were there behind the Golden Gopuram of the Tirumala Temple..
Poor soul Viswapathi is a normal human being like you and me and hence could not withstand the dazzling view of Bhagawan Venkateswara’s Viswa Roopam for more than a few seconds and later closed his eyes.. 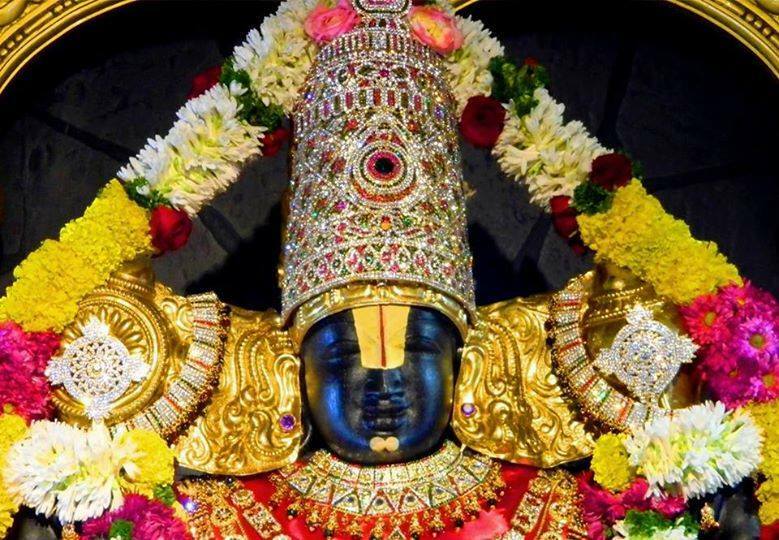 Observing His ardent devotee’s plight,the holy Bhagawan Sri Venkateswara smiled and withdrew His Viswa Roopam and later addressed Viswapathi through the sacred Seven Hills that were then visible to Viswapathi..
And this is what the Bhagawan told Viswapathi in colloquial Telugu diction (Sishta vyavaharika Telugu)..
“In an effort to save these devotees from all the problems of this human world I have decided to tell them,through you,about a very simple pooja called Venkateswara Vratham..My devotees need not follow any rituals while performing this pooja as I want it to be very easy for them to perform.. 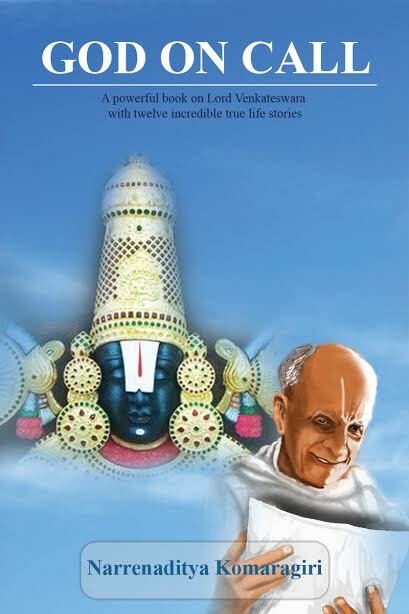 “Viswapathi..I want you to write about this entire pooja in a book with the title ‘Sri Venkateswara Vratha Kalpam’..In all,there would be five different stories in this book that are related to the lives of my five ardent devotees.. “..Remember Viswapathi there will be two simple methods in the story for the devotee to choose..The devotee may choose any of these two methods and perform the pooja accordingly..He would still derive all the benefits am offering to him through this pooja ..And on the day a devotee performs this pooja I shall certainly visit his home in some form and collect my Prasad “..
Saying so,the Bhagawan narrated the first story and slowly disappeared..After that,the four holy Indian sages appeared before Viswapathi,as instructed by Sri Venkateswara,and narrated the rest of the four stories..Although Viswapathi could clearly hear their voices he could only see their sacred feet..
Later,without altering a word in the stories narrated by Lord Sri Venkateswara and the four other holy sages,Viswapathi got the Telugu book “Sri Venkateswara Vratha Kalpam” printed in Telugu language..
By spending his own money he then got ten thousand copies of this book printed in the very first edition and later distributed them all,free of cost to devotees through many temples of Lord Sri Venkateswara, located in Andhra Pradesh..
From one devotee to the other devotee and from one nation to the other nation this miraculous book went across seas and oceans and traveled to many nations.. This book today is translated into many Indian languages like Hindi, Kannada, Marathi, Tamil and also into English and many foreign languages..
First Method : A devotee may hire the services of a Purohith or a Poojari to perform this pooja in his house and follow all the procedure mentioned in the book..He may also invite his close friends and family members and offer them lunch..
Second Method : A devotee may sit quietly at one place in his house,after taking bath,and read only the five stories in the book and may ignore the other procedure involved.. Since 2005 many devotees all over the world have performed this pooja in their houses choosing either of the above two methods and have derived many benefits.. Many devotees in their experiences have said that whenever this pooja was performed some unexpected friend or a relative or an unknown visitor would come to their house and collect the Prasad.. Some devotees have even said that a Cow came from nowhere and had taken the Prasad and vanished..It means as promised,Lord Venkateswara Himself is visiting these devotees’ houses to collect His Prasad..
Thousands of devotees who could not get a copy of the book had taken it’s xerox copies and performed this pooja in their houses..
Viswapathi had written the book only in Telugu language whereas all other versions were written by the devotees on their own after experiencing many amazing miracles from performing this pooja.. In addition to this book,Sri Viswapathi had written,both in English and Telugu languages,twenty one more amazing devotional books out of which thirteen are on Lord Sri Venkateswara alone..
You can reach Sri Viswapathi on his mail i d viswapathi@yahoo.com.. You may click here to visit his website for all the info about his other devotional books..
Years later,this noble lady contacted Viswapathi..Took a copy of Sri Venkateswara Vratha Kalpam from him and ever since has been performing this pooja every month in her house in America and is experiencing unbelievable miracles..
She has chronicled all these miracles in a proper order and combined them with the five stories from Viswapathi’s book and had printed a new book which is available everywhere today..This book is translated into many European languages too.. While browsing through some literature books in a TTD bookstall in Hyderabad,a couple of months ago,I have stumbled upon Viswapathi’s Telugu version of Venkateswara Vratha Kalpam..As though meant only for me,there was only copy available in that shop..I had paid ten rupees and purchased the book..
After coming home I told my wife that “I feel like performing this vratham at home”..She said fine and we decided to perform it on 4th October, 2014 just because it was a holiday for our daughters too..I wanted to do it in the best possible way and engaged a well learned Purohith to perform the pooja..I had also invited all our family members and hosted a lunch for them.. But I was shocked when the Vedic Purohith asked me before the pooja..”Did you plan to perform this pooja today just because it is Lord Venkateswara’s Jayanthi..”..Honestly,until that moment I wasn’t aware that Lord Venkateswara’s Jayanthi is celebrated..
Finally,the immediate reason that prompted me to write this article is..Two weeks ago my wife’s first cousin Suma Latha who resides in Bangalore asked me if I know anything about Venkateswara Vratham..I said..”..I know everything about this vratham but why are you asking me now”..